In the first part of this mini-series, I describe how various ideas important in probability theory arise naturally when you start doing linear algebra using only the nonnegative real numbers. But after writing it, I got an email from a rather famous physicist saying he got “lost at line two”. So, you’ll be happy to hear that the first part is not a prerequisite for the remaining parts! I wrote it just to intimidate that guy. • a morphism consists of a deterministic ‘measurement process’ mapping states of one system to states of another, together with a ‘hypothesis’ that lets the observer guess a probability distribution of states of the system being measured, based on what they observe. The second, is a subcategory of It has all the same objects, but only morphisms where the hypothesis is ‘optimal’. This means that if the observer measures the system many times, and uses the probability distribution of their observations together with their hypothesis to guess the probability distribution of states of the system, they get the correct answer (in the limit of many measurements). In this part all I will really do is explain precisely what and are. But to whet your appetite, let me explain how we can use them to give a new characterization of relative entropy! Suppose we have any morphism in In other words: suppose we have a deterministic measurement process, together with a hypothesis that lets the observer guess a probability distribution of states of the system being measured, based on what they observe. Then we have two probability distributions on the states of the system being measured! First, the ‘true’ probability distribution. Second, the probability that the observer will guess based on their observations. 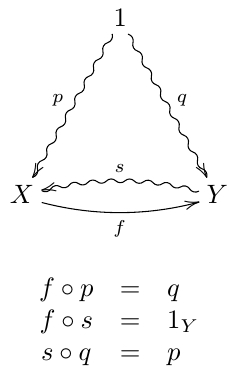 Whenever we have two probability distributions on the same set, we can compute the entropy of the first relative to to the second. This describes how surprised you’ll be if you discover the probability distribution is really the first, when you thought it was the second. So: any morphism in will have a relative entropy. It will describe how surprised the observer will be when they discover the true probability distribution, given what they had guessed. that vanishes on the subcategory must equal some constant times the relative entropy. Don’t be scared! 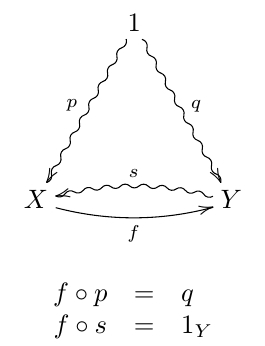 This should not make sense to you yet, since I haven’t said how I’m thinking of as a category, nor what a ‘convex-linear lower semicontinuous functor’ is, nor how relative entropy gives one. I will explain all that later. I just want you to get a vague idea of where I’m going. Now let me explain the categories and We need to warm up a bit first. A stochastic map is different from an ordinary function, because instead of assigning a unique element of to each element of it assigns a probability distribution on to each element of So you should imagine it as being like a function ‘with random noise added’, so that is not a specific element of but instead has a probability of taking on different values. This is why I’m using a weird wiggly arrow to denote a stochastic map. Note that we can think of as a -shaped matrix of numbers. 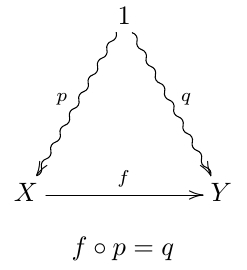 A matrix obeying the two properties above is called stochastic. This viewpoint is nice because it reduces the problem of composing stochastic maps to matrix multiplication. It’s easy to check that multiplying two stochastic matrices gives a stochastic matrix. So, composing stochastic maps gives a stochastic map. Definition. Let be the category of finite sets and stochastic maps between them. In case you’re wondering why I’m restricting attention to finite sets, it’s merely because I want to keep things simple. I don’t want to worry about whether sums or integrals converge. Why? Because it gives a probability distribution on for each element of but that set has just one element. Note that the horizontal arrow is not wiggly. The straight arrow means it’s an honest function, not a stochastic map. But a function is a special case of a stochastic map! So it makes sense to compose a straight arrow with a wiggly arrow—and the result is, in general, a wiggly arrow. 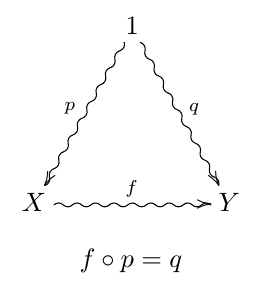 So, it makes sense to demand that this triangle commutes, and this says that the function is measure-preserving. Let me work through the details, in case they’re not clear. In this situation people say is pushed forward along , and they say is a measure-preserving function. Definition. Let be the category of finite probability measure spaces and measure-preserving functions between them. The idea is that is the set of ‘states’ of some system, while is a set of possible ‘observations’ you might make. The function is a ‘measurement process’. You ‘measure’ the system using and if the system is in the the state you get the observation The probability distribution says the probability that the system is any given state, while says the probability that you get any given observation when you do your measurement. Note: are assuming for now that that there’s no random noise in the observation process! That’s why is a function instead of a stochastic map. So, if you make an observation you will guess the system is in state with probability zero unless In short, you won’t make a really dumb guess about the system’s state. and composition is defined as above. In other words, is a measure-preserving stochastic map. So, to be utterly precise, is determined by and unless there’s an element that has Except for this special case, a morphism in is just a morphism in But in this special case, a morphism in has a little extra information: an arbitrary probability distribution on the inverse image of each point with this property. In short, is the same as except that our observer’s ‘optimal hypothesis’ must provide a guess about the state of the system given an observation, even in cases of observations that occur with probability zero. • Tom Leinster, An operadic introduction to entropy. Despite the common theme of entropy, he arrived at it from a very different starting-point. I don’t count on it… but I can hope. And speaking of unrealistic hopes, if I were really optimistic I would hope you noticed that and which underlie the more fancy categories I’ve discussed today, were themselves constructed starting from linear algebra over the nonnegative numbers in Part 1. That ‘foundational’ work is not really needed for what we’re doing now. However, I like the fact that we’re ultimately getting the concept of relative entropy starting from very little: just linear algebra, using only nonnegative numbers! This entry was posted on Tuesday, July 2nd, 2013 at 8:06 am and is filed under information and entropy, mathematics, probability. You can follow any responses to this entry through the RSS 2.0 feed. You can leave a response, or trackback from your own site. Thanks John, this was admirably clear & self contained; I think I got most of it using only an elementary understanding of sets, mappings, probability distributions, and summation and composition notation (though I might be deluding myself, as I’m still fuzzy on what a category is and on exactly what a morphism is; and I still don’t think I know what it means for a diagram to ‘commute’:-). “unless there are observations that happen with probability zero—that is, unless there are “: Do you mean Y instead of X? “unless there are observations that happen with probability zero—that is, unless there are ”: Do you mean instead of ? Yes, thanks—I’ll fix that. Deliberately calling an element of “ ” would be heinous mathematical crime… here in Singapore I’d probably get caned for it. I’m really glad you found the exposition clear! I’m warming up to write a paper about this, so I need to know what works and what doesn’t. A diagram commutes whenever, given two ways to get from one object to another by following a chain of arrows, those two ways are equal. In this case we have two ways to get from to There's a direct way using just and indirect way using first and then But they are equal—that's what the equation below the diagram says. 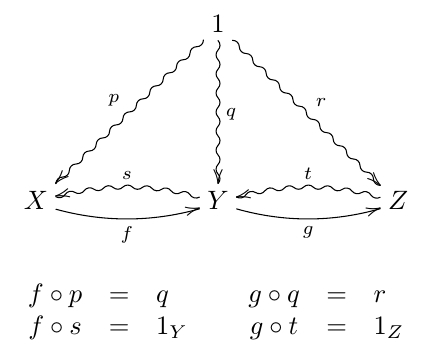 If I were talking to category theorists, I could skip the equation and just say "the diagram commutes". (a typical sort of thing you see on an algebraic topologist’s whiteboard, drawn by Patrick Orson.) Instead of writing down dozens of equations, you get a nice visual depiction of what’s going on, and you can learn to reason very quickly with these diagrams. 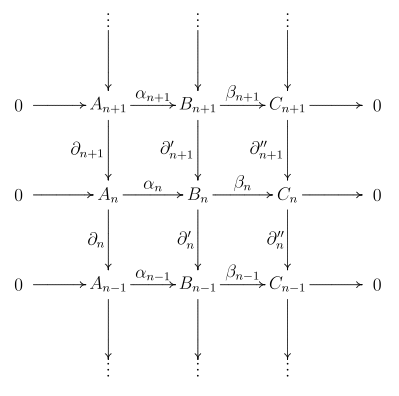 Unfortunately my post is not a great introduction to commutative diagrams, for two reasons. First, I’m heavily using two kinds of arrows, straight ones and wiggly ones. This is a bit nonstandard; it means my diagrams involve not just one category but two: the category of finite sets and stochastic maps (wiggly arrows), and a subcategory of that, the category of finite sets and functions (straight arrows). If you’re just getting started at this game, you’d want to start with one kind of arrow. As an exercise you can try to guess an equation not listed here that would hold if the diagram did commute. Yes indeed—I’ll fix that. Thanks! 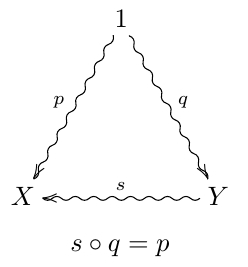 I think that the equation ‘q then s yields the same distribution on X as p does’ answers your exercise (in other words, as you imply above, if its diagram commutes a hypothesis is optimal). Can anyone see what this condition amounts to? But then Tobias Fritz noticed a big problem.